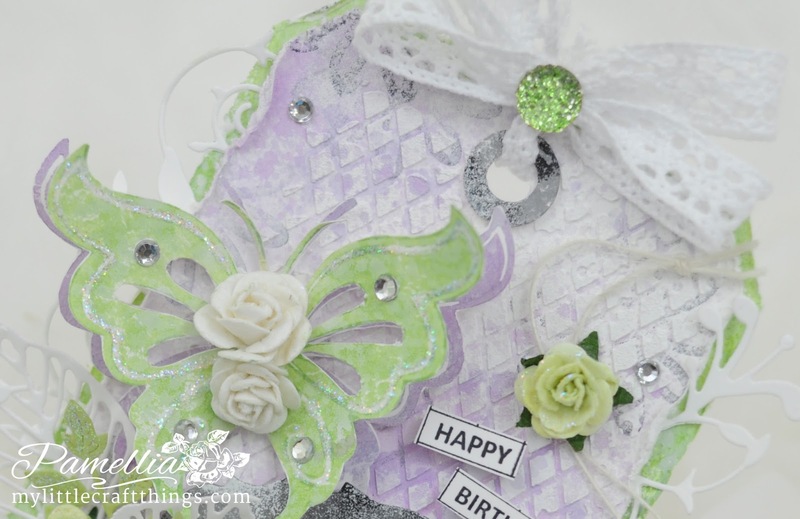 It's time for another challenge over at Crafty Cardmakers and More! This time around I am going to be the hostess, and I have chosen the theme FOR A SPECIAL WOMAN. I thought I would sandwich my super greasy steampunk card in between two super shabby feminine creations, just for fun!! I decided to make a bright spring tag to go on the gift bag that will hold my Mom's Floating Rock Garden, she just loves nature, so the butterfly is for her...the bling was just for me. lol. I can't wait to see what you come up with! The background was done with DecoArt Lavender paint and a Memory Box stencil. The sentiment is from Heartfelt Creations. The frame is cut from Tim Holtz Tag and Bookplates and coloured with Tim Holtz Black Soot paint and DecoArt Zinc paint with a touch of Picket Fence. 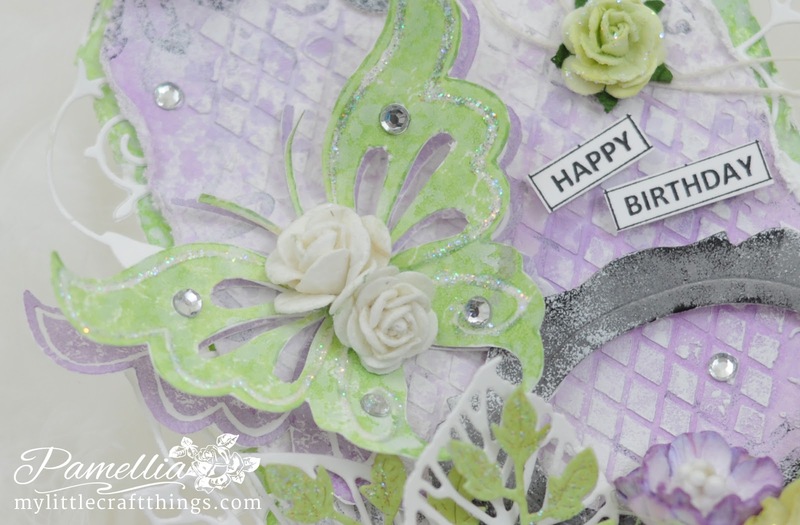 I used a Recollections Butterfly stamp and stamped one in DecoArt Americana Lavender and one in DecoArt Crafter's Irish Moss. I fussy cut them out and traced the outline with Star Dust stickles. The Tim Holtz Gumdrop was coloured with Ranger Alcohol ink Meadow. The fancy flourish die down the side is Honeysuckle Vine from Memory Box. The white filigree leaves are from my new Prima die...YES FAITH, THAT MAKES 806!!! hahaha The little green leaves are from Cheery Lynn Designs. I cut them from a pale green paper and then coloured them with Tim Holtz Bundled Sage and some Star Dust stickles. So shimmery! 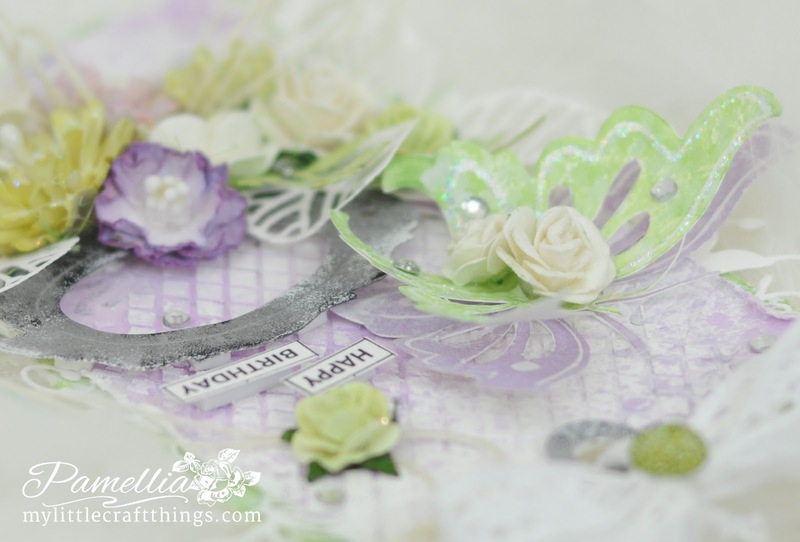 The flowers were cut from Joy Crafts 4 and coloured with Tim Holtz Milled Lavender, Dusty Concord and Shabby Shutters. I added some Star Dust stickles here too. Some pretty gemstones and a butterfly charm to add a little bling. The flower stamp was from the same set as the butterfly. Name unknown, I threw away the package for some strange reason! 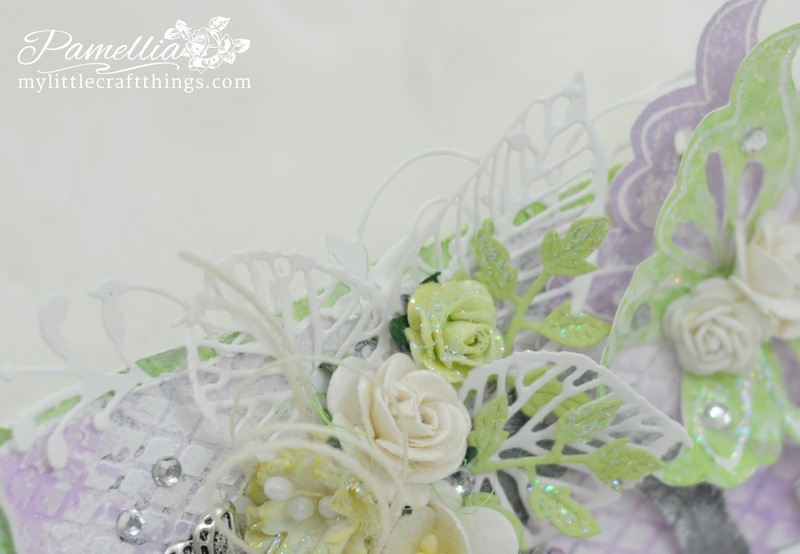 This is beautiful, I love the lime green and lilac colour combination, it is so fresh and conjures images of spring. Your new leaf dies are working out really well and can you ever have too many butterflies, I think not! Just WOW and ohhhh from me today! Pamellia, your tag is stunning! I can smell the spring flowers! These skeleton leaves are gorgeous! So shabby, so fresh! The colors are fabulous! I love all the embellishments here! Heavenly gorgeous tag Pamellia! Your mom will love it, I'm sure! Great job capturing that shimmer in your photo! I always have such hard time trying to get the glitter to show....I love the way you arranged everything on your tag, so pretty! Truthfully I am still thinking about that masculine card you made for your dad...to say you blew my mind would be just scratching the surface of truth!! What can I say??? You are a genius!!! Ooohh how pretty is this! I love the colour scheme and the sparkle & bling. As always, your flowers are just perfect.Your Mum is sure to love this. Heavenly beautiful tag, Pamellia. It's like a beautiful dream. Lucky who will get this beauty. SIGH!!! This is so lovely and soft Pamellia!! A GORGEOUS tag filled with beautiful goodies, technique and luster!! You are the MASTER of everything creative dear Pamellia!! Wishing you a most wonderful day!! 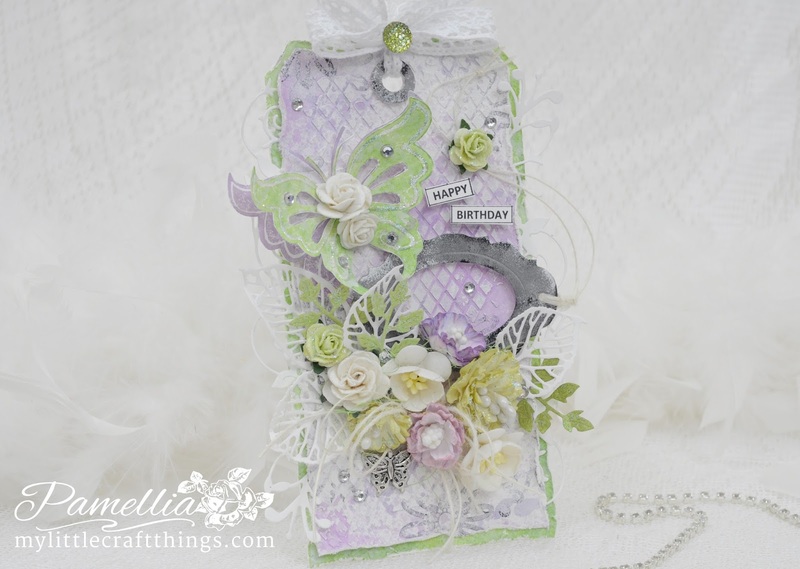 What a gorgeous spring tag, Pamellia! The colors are totally luscious and I love that butterfly! What a lovely surprise for your Mom! Happy Birthday to her! Gorgeous tag love the lavender and pale greens together. Your Mom will be in AWE . Beautiful and Spring like! Pretty colors and wonderful layering. Lovely for your Mom. This is just the prettiest tag Pamellia, I love the soft colours and all your detail, wonderful work! A beautiful tag for your Moms gift. Oh dear I made an error with the hostess Pamellia, never mind. Pamellia this is stunning I am so in awe of you stupendous design talent, the close up pictures make my mouth water, absolutely beautiful creation. Wow, a vision of pure unadulterated loveliness! Your Mum will absolutely adore this as well as her lily pond. PS. . . . Me, use mixed media? Its a vicious rumour! Lol! 806? I think you have miscounted LOL. Pamellia, another stunning vision, so very very beautiful, I LOVE what you have done with the dies. They deserve a place in your home. VASTLY different from your steampunk, but hey, that's your art isn't it? Absolutely stunning Pamellia, such pretty pastel colours and beautiful details as always. I entered my HM card into the challenge, thank you for mentioning it. Beautiful tag. Love the colours, especially the stencilled background, and as ever you have brought all the elements together so brilliantly. I definitely need some stardust stickles! Thanks for joining in at Crafty Boots challenges this time. Your mom is going to be thrilled to receive this Pamellia, it's stunning. I love the delicate, pretty colours. All your detailing is so beautiful and the added sparkle looks wonderful too. 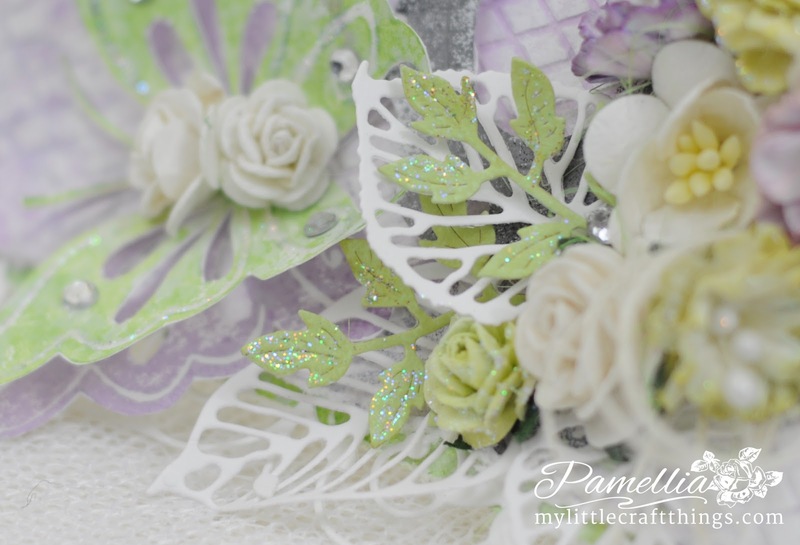 Stunning tag Pamellia, love the soft colours and of course all those beautiful die cuts. Totally stunning, Pamellia! Your lucky Mum is sure to love it. Every time I look at one of your creations, I see another fabulous element. Such a breezy and cool creation...a mini garden inside the house! Love it Pamellia and am sure your mom will too! The colors are really refreshing. Big Hugs from here, my friend. What a great girly card, Pamellia! I love the soft colors! Thanks for sharing this with us at the Simon Says Stamp Wednesday challenge! Beautiful Pamellia! Love all the gorgeous blossoms and shimmery detail! 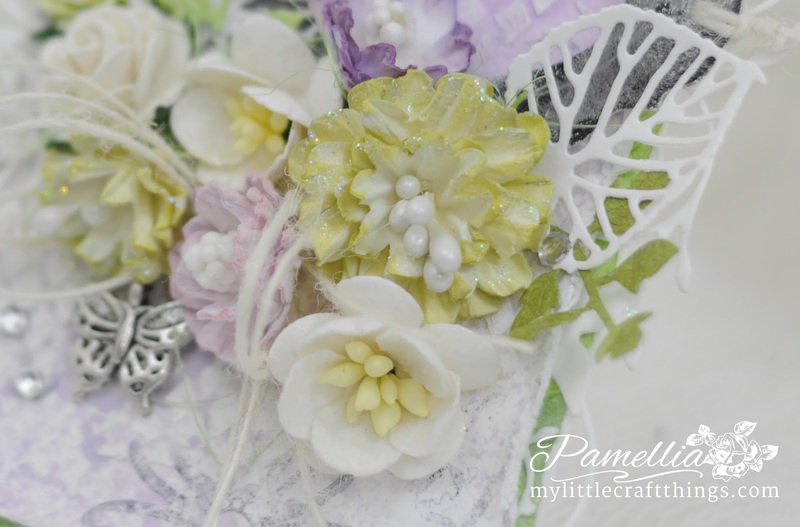 A beautiful creation and just perfect for my Spring theme Pamellia. Wow Pamellia, how did I miss this yesterday? This is stunningly beautiful - the soft colours are divine and your attention to detail is superb. This is so beautiful and I'm sure will be treasured. So so sweet and delicate Pamellia ,just beautiful. Gorgeous, gorgeous tag, so pretty and very decorative, I just love it. This will look amazing on the gift bag. Absolutely beautiful. What stunning colours ... I can't wait to see the garden change into these colours ... Wonderful tag as always beautifully executed! I just love the purple and green soft coloring on this! as well as the lovely glitter! Just gorgeous,Pamela. 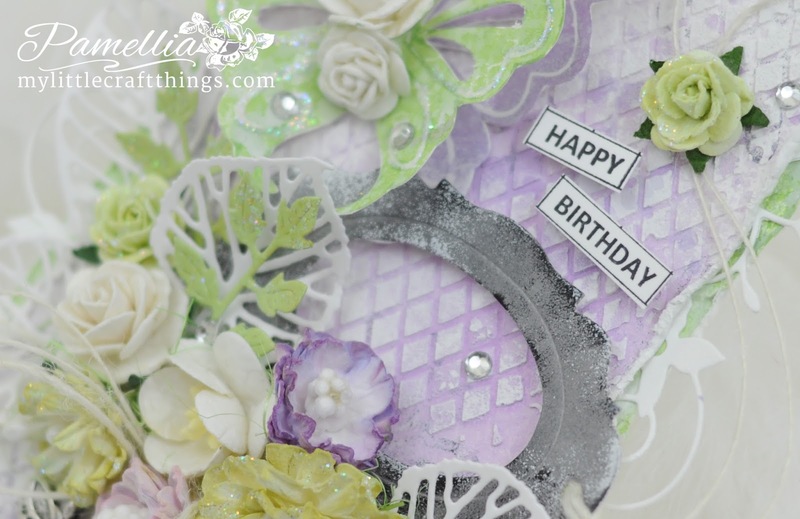 I love the soft lilac color and the fab details of your card. Gorgeous tag, love the colours and beautiful details and embellishments. Oh this is gorgeous Pamellia! I love the soft lavender colors and all of the beautiful textures!! I'm back again to say thank you for sharing your work with all of us at Crafty Boots Challenges. Mind you, this tag is worth a second visit. I just in love with this tag. It is perfect. Late again, but blessed twice in one day with your lovely tag here. Your Mom is one lucky lady, but then again, I think you are lucky to have your Mom. Gorgeous color combination, great textured background, embellishments that are so carefully chosen and perfectly placed! Your flowers are just scrumpdilli-icious, and I CAN NOT believe you fussy cut those butterflies and outlined them with Stickles! No coffee that day???? Can you tell me where you get your flower centers and stamens? I'm having a hard time locating any here. Thank you for sharing this amazing work of art with us! Hugs! So pretty with the delicate spring colours - I'm sure your mother will absolutely love it. Such pretty colours and embellishments. A promise of Spring to come. A stunning tag. Your green and purple colour combination is gorgeous and the floral arrangement is beautiful. 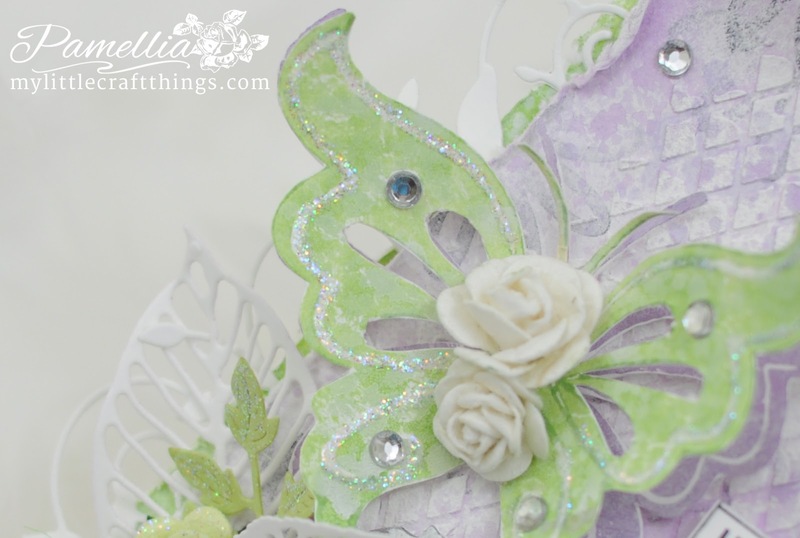 The butterfly is very pretty and the leaf dies your have used are fabulous. Sally.x. Beautiful tag - such an elegant design.